Did I mention we moved? Not too far... just across the county... but still it's kinda a big county. So we've been finding all new favorite spots and settling into being locals in our new locale. Hands down, our favorite new spot is an amazing architectural salvage store that repurposes vintage furniture (i.e. takes old pieces that are unique and beautiful but don't play so well with Pottery Barn/Ikea/anything made in the current decade and remakes them into something totally hip and awesome), Marcotte's. Our most recent purchase at Marcotte's is a school room map of the United States. The colors were perfect for my girls' playroom and since our family is spread out across the country it was a great way to demonstrate the answer to the question "can we go to grandma's house tomorrow?!". Once we had the map hung over the couch in the playroom, the old typical pillows that came with the couch looked really... well old and typical. 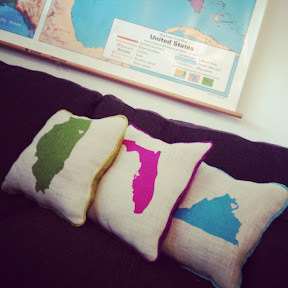 Pillows are the most sewing 101 project ever and somewhat uninspiring but that wouldn't do for this fun space. 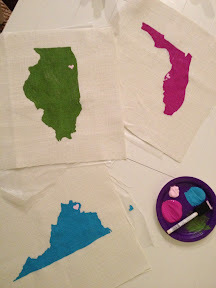 Taking a queue from the map, I decided to combine 2 great DIY crafts, freezer paper stenciling and painted burlap. 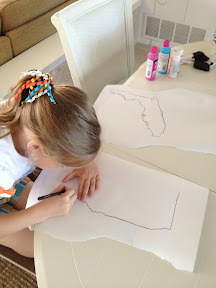 I started by searching the internet for an outline of each of the states the girls' grandparents live in (IL, FL, and VA). 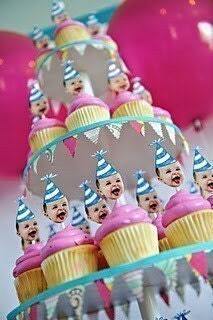 I printed them and my 7 year old traced them onto freezer paper. I cut the center of the states out and also cut little hearts to show the location of their hometown cities (keep the negative space for the heart cut outs too). 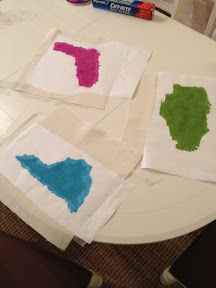 After ironing the freezer paper stencils (including the little heart over the city) onto the center of the burlap squares that would become the pillow fronts, I painted them with a foam brush and fabric paint. Once they were dry I pealed off the freezer paper hearts and ironed the heart outlines over the heart space so I could paint the hearts a different color. That's it! The rest is just pillow making 101 (well except the piping which was a new endeavor for me, maybe I'll post a little tutorial for that some other day).